ran by Families, much like ours, that choose not to compromise their Independence, Sustainability of Resources and Quality of their Products for the sake of Larger Corporate Profits. 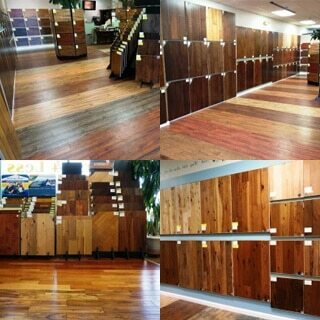 Opened in April of 2010, Quality Floors 4 Less is not a household name just yet, though we are not new in this business by any means- since 2002 we’ve professionally installed for Reno and Sparks flooring stores such as: Floors2Go, Hardwood Warehouse, GCO, Flooring Masters, Priism Enterprises and others. Throughout the years we’ve quietly noticed the insufficiency of flooring retailers: a waste of energy, resources, space, money and time, and as a result- the fact that Quality Floors were affordable to only a few! To cover the staggering costs of rent, overhead, interest rates, utility bills and advertising expenses, retailers have to mark up well in excess of 100% over the manufacturers’ prices, creating an illusion of non-affordability for most families… We’re on a mission to challenge that- Quality Floors 4 Less: carefully blending Top Quality with Honest Prices since 2010! 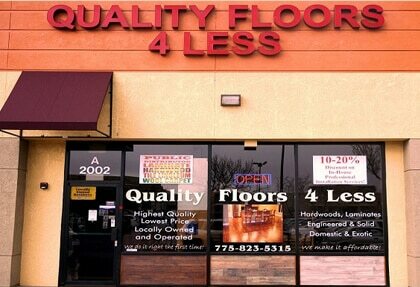 Dear Friends, Quality Floors 4 Less is not in business of competing with Home Improvement, Big-Box or Liquidation Stores for the Lowest Prices. We are not called “Cheap Floors for Less” for a reason- Our Mission is to make Premium Floors affordable for people who understand that Poor Quality will always catch up with the “Good Deal” and there will be no-one to complain to because You always get what you pay for and you know it! If your only comparison is Cost and you’re looking for The-Cheapest-Stuff-I-Can-Possibly-Find type of “Deal”- we will not be able to help you, sorry. Please take this friendly advice, though- 30 minutes of research will keep you out of many Corporate Traps out there- just Google something like “Lumber Liquidators Reviews”– a little research will keep You out of harm’s way and will save you Thousands of Dollars and an unknown amount of nerve cells! Stop-by before you Buy- you’ll be glad you did… We hope to see you soon!